SNP shortens, simplifies, and optimizes your SAP Solution Manager projects. Drawing on experience and best practice knowledge from over 500 successful projects, we have developed preconfigured add-ons and IT processes for you. More than 50 SNP experts are at your disposal for strategic and organizational consulting and technical implementation. Together with you, we define a clear roadmap and extract maximum added value from SAP Solution Manager's functions for your organization. Get in touch now to start using SAP Solution Manager more efficiently in the future – reap the benefits for your IT and your next large-scale SAP S/4HANA projects. SAP Solution Manager Roadmap Assessment: Working together, we analyze your IT processes, identify optimization potential, and formulate possible uses for SAP Solution Manager. We also integrate your already established tools and processes as required. SNP Application Lifecycle Assessment for SAP Solution Manager: We examine your core IT processes and tools, talk to your team, and help you to determine the maturity of your IT processes – optimizing them through SNP best practices. Our team of over 50 experts covers the entire SAP Solution Manager spectrum, fully supporting small and large projects during the go-live and beyond. Access our knowledge and experience from over 500 successful SAP Solution Manager projects in the form of best practices and add-ons. Our technology team supports you in making strategic decisions about cloud and on-premises solutions, SAP HANA, and your system architecture and always provides professional installation. In addition, our health check identifies configuration problems in your landscape before the project starts. Process management, change request management, release management, test management, IT service management, custom code management, monitoring: We offer standardized approaches for these areas in SAP Solution Manager and many more. Furthermore, our project experience enables us to introduce and integrate processes in a professional and organized manner. Do you want to take advantage of IT service management processes or change request management processes in SAP Solution Manager? Then look no further than our Ready-to-Run solutions. Our preconfigured package is ready for use in just one day, including authorization roles, documentation, training material, and go-live service – supplemented by our add-ons upon request. After your go-live, our AMS team provides professional support going forward. We take on the support role and maintain SAP Solution Manager for you, allowing you to focus on your core business. We have integrated SAP Solution Manager with tools such as Jira, Remedy, ServiceNow, and HP Service Manager in dozens of integration projects. Our standardized approaches guarantee successful projects at high speed. 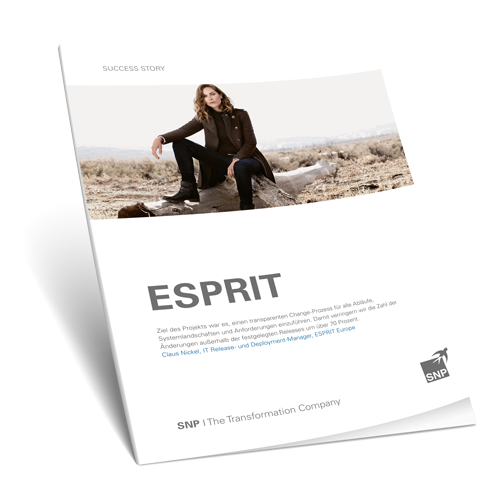 Our transformation software merges SAP Solution Manager systems that operate simultaneously and consolidates the data in a central SAP Solution Manager system. We can also split one SAP Solution Manager system for use in different companies. Converting to SAP S/4HANA presents a real challenge. The solution is SAP Solution Manager – software that supports your project and allows you to introduce new IT processes. During the assessment phase, we work together to analyze your IT processes, identify optimization potential, and formulate possible uses for SAP Solution Manager. We also integrate your already established tools and processes as required. Large agile projects require a solid requirements-to-deploy process to facilitate the requirements definition, process definition, project management, implementation, testing, and release management. SAP Focused Build contains preconfigured SAP Solution Manager functions and processes that provide optimal support. We are an SAP Focused Solutions Circle Partner. As such, we can leverage our experience from successful past SAP Focused Build projects to support you: Take part in our Potential Workshop to find out whether SAP Focused Build is right for you and discover how to best integrate it into your projects. Our standardized SNP Add-ons for SAP Solution Manager can be seamlessly integrated into your SAP environment and are immediately ready for use. The e-mail add-ons are easy to configure and enable integration of your email program through email notifications and by processing incoming emails. The screenshot add-on integrates screenshots directly into tickets, while the PDF add-on allows you to archive old processes. You need to adhere to the EU GDPR guidelines in SAP Solution Manager too. Our experts can help you to analyze and clean up data and to implement the new rules in your SAP Solution Manager system. SAP S/4HANA migration is more than just an update. It changes technology, business processes, and user interfaces. Many organizations still underestimate these projects. For example, did you know that an IT department should schedule up to 15 months of preparation time? Or that SAP Solution Manager 7.2 plays a decisive role long before SAP S/4HANA goes live? Access this information and other important tips for preparing for the switch to SAP S/4HANA in our exclusive Best Practice Guide. 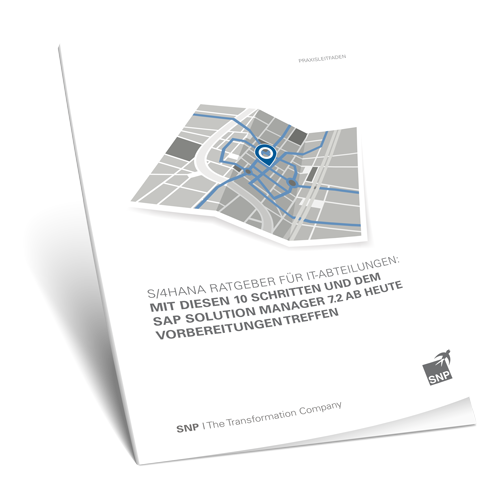 Download the guide now and ensure that your SAP S/4HANA project is a success. 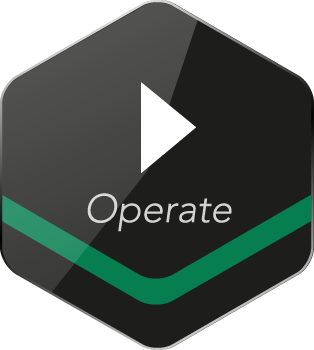 In our download area under "Operate", you can access some of our case studies from successful past SAP Solution Manager projects. We will be happy to send you further references and reports on industry-specific projects on request.